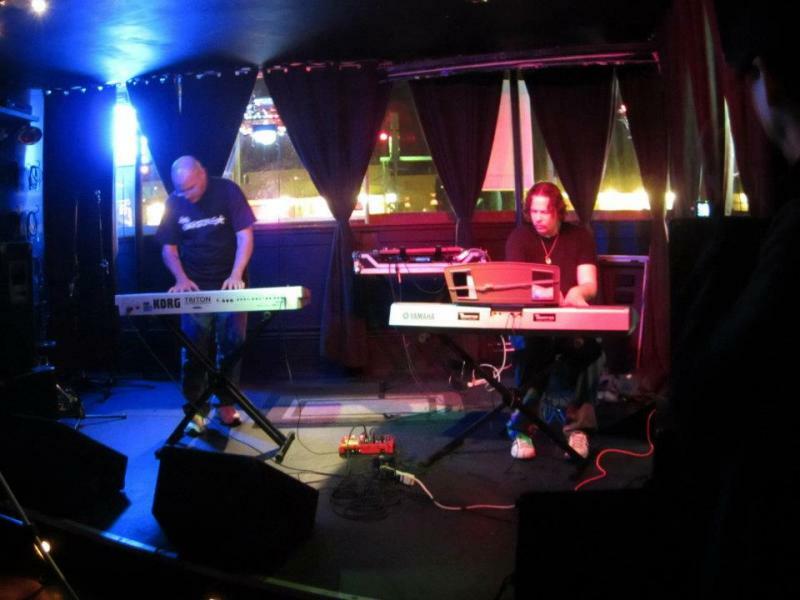 the Smokering - Ed and Jason, better known as the music production duo The Smokering, have been building their self-produced catalog for over the past 13 years.Ed was born & raised in New York and has called Los Angeles home for more than 30 years. East Coast hip hop roots are the foundation of Ed's vision for the Smokering's signature sound. Jason is a Southern California native. Surrounded by music & film all his life, the influences on his music are endless, including Miles, Quincy, Beasties and Jimi.The duo have always drawn from a deep well of musical influence and personal experiencesto produce an ever expanding collection of music that is difficult to classify.The beginning: 2005 - four complete studio albums right out of the gate: "Escape From Van Nuys", "Fall Classic", "Poder A Le Gente", and "Tropicalifornia". These albums were recorded and produced during one of the hottest summers on record in Los Angeles.The Smokering released the classic "13" in 2006. Four additional albums were created that year, notably "Scorpittarius",and the late-nite chillout masterpiece "La La Land", which yeilded two of The Smokering's most well received songs, "Freshoutdabox" and "Sativa". Over the next few years Ed & Jason would work with a host of formidable artists including Lumis (Bazerk, Pigface), David "Mavis" Senescu (Cynic, ONLY), and bassist Ray Burke (Bruce Dickinson, Live After Death). "Blacklight District", released in 2007, is the album that defined the duo andrealizes their distinct “soundtrack" vibe. They would record 2 more albums that year: "The Motherboard Connection" and "Floatation Device". Both are unreleased.2008 found the Smokering duo transforming into group form, with the addition of Lumis on turntables and vocals, Ray Burke on bass, and Leanna Burke & Larry Foster on percussion. This collective blazed through 4 shows and left an edilible mark in their wake. Crowd response was not only positive, but overwhelming.In the latter part of 2008, Ed & Jason returned to the studio to create the lush and dynamic "Colorformed". Chillout, funk, trip hop, r&b, dub reggae, and even a touch of smooth jazz can be heard on this breathtaking album.September 2009 the compilation '05 - '09 was released. It features choice tracks from their first 13 albums. It can be found on iTunes, Amazon.com & CD Baby.Fall 2010 brought new music from the Smokering. "Mellow Majestic" was released on Global Vortex Records. This album is a sophisticated blend of old school and nu-skool trip hop.Fresh sonic landscapes blanket the air & strings fuse with hip hop rhythms & psychedelic vibes. In April 2011 the Smokering released the first installment of their new mixtape series "Adventures In Wi-Fi". "Disco Balls", the retro uptempo dancefloor energy filled E.P. was released on May 16th, 2011 on iTunes, Amazon and CD Baby.﻿In Fall 2011 The Smokering embarked on a new music collaboration with Lumis James = AUDIO 3.Thier self-titled album is massively eclectic, featuring original material spanning many genres of music.The 14-track collection is available for free download, click here.The 2nd installment of "Adventures In Wi-Fi" was released June 12th, 2013. It features more original music by The Smokering, in a continuous 1-hour mix. Listen & download it for free here!The Smokering's new album "Morningstar" was released June 15th, 2013 on Chill Om Records India. "Perceptions", a previously unreleased song, was issued as a single by The Smokering, August 12th, 2014. This track captures a classic dancefloor vibe, with The Smokering's signature psychedelic vibes.Our 10-year music retrospective "Reflections" was released December 2nd, 2016 and is out now on iTunes, Amazon, CD Baby and more! have been building their self-produced catalog for over the past 13 years. Ed was born & raised in New York and has called Los Angeles home for more than 30 years. East Coast hip hop roots are the foundation of Ed's vision for the Smokering's signature sound. the influences on his music are endless, including Miles, Quincy, Beasties and Jimi. to produce an ever expanding collection of music that is difficult to classify. "Escape From Van Nuys", "Fall Classic", "Poder A Le Gente", and "Tropicalifornia". These albums were recorded and produced during one of the hottest summers on record in Los Angeles. The Smokering's most well received songs, "Freshoutdabox" and "Sativa". and bassist Ray Burke (Bruce Dickinson, Live After Death). "The Motherboard Connection" and "Floatation Device". Both are unreleased. Lumis on turntables and vocals, Ray Burke on bass, and Leanna Burke & Larry Foster on percussion. This collective blazed through 4 shows and left an edilible mark in their wake. Crowd response was not only positive, but overwhelming. can be heard on this breathtaking album. September 2009 the compilation '05 - '09 was released. It features choice tracks from their first 13 albums. It can be found on iTunes, Amazon.com & CD Baby. Fall 2010 brought new music from the Smokering. "Mellow Majestic" was released on Global Vortex Records. This album is a sophisticated blend of old school and nu-skool trip hop. Fresh sonic landscapes blanket the air & strings fuse with hip hop rhythms & psychedelic vibes. their new mixtape series "Adventures In Wi-Fi". In Fall 2011 The Smokering embarked on a new music collaboration with Lumis James = AUDIO 3. Thier self-titled album is massively eclectic, featuring original material spanning many genres of music. The 14-track collection is available for free download, click here. The 2nd installment of "Adventures In Wi-Fi" was released June 12th, 2013.
in a continuous 1-hour mix. Listen & download it for free here! The Smokering's new album "Morningstar" was released June 15th, 2013 on Chill Om Records India. "Perceptions", a previously unreleased song, was issued as a single by The Smokering, August 12th, 2014. This track captures a classic dancefloor vibe, with The Smokering's signature psychedelic vibes. Our 10-year music retrospective "Reflections" was released December 2nd, 2016 and is out now on iTunes, Amazon, CD Baby and more!